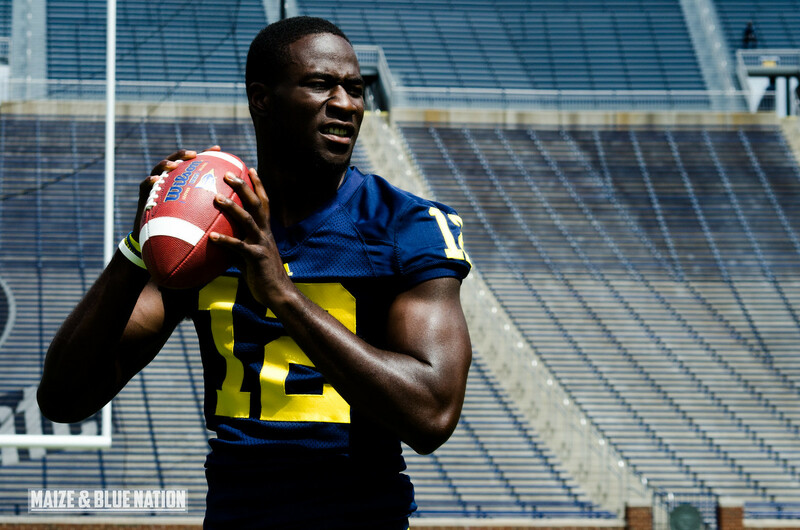 We all know Devin Gardner as a quarterback thanks to his 5 games as the signal caller to finish out the 2012 season. While Gardner was certainly a success at QB, that was a year ago in an offense that will be much different from what we'll see 17 days from now. Gone are the days of relying heavily on the spread. Team 134 will offer a pro-style much more familiar to Michigan fans who can remember the old days before 2008. Gardner, who is receiving a lot of pre-season hype, is a tall, athletic, and powerful quarterback. Much like a Cam Newton or RG3 or Colin Kaeppernick, it's easy to see why so many are so high on his potential. His arm strength and accuracy are much better than Denard's. Devin did play receiver for 8 games last year, and while he's no receiver...that does speak to his ability as a runner. And that's what has people so excited. A rare, but increasingly potent combination of tall, fast, and a precise thrower. A big part of Devin's success is going to be based on how much he can rely on the backs around him. This will not be a season like 2010 when 90% of the offense revolves around the quarterback. Borges must create threats with the running backs and the receivers. And I think he will. This spring, backup Russell Bellomy tore his ACL, leaving him out for the entire 2013 season. This leaves Michigan down to just two scholarship quarterbacks with Gardner and incoming 5-star freshman Shane Morris (#7). 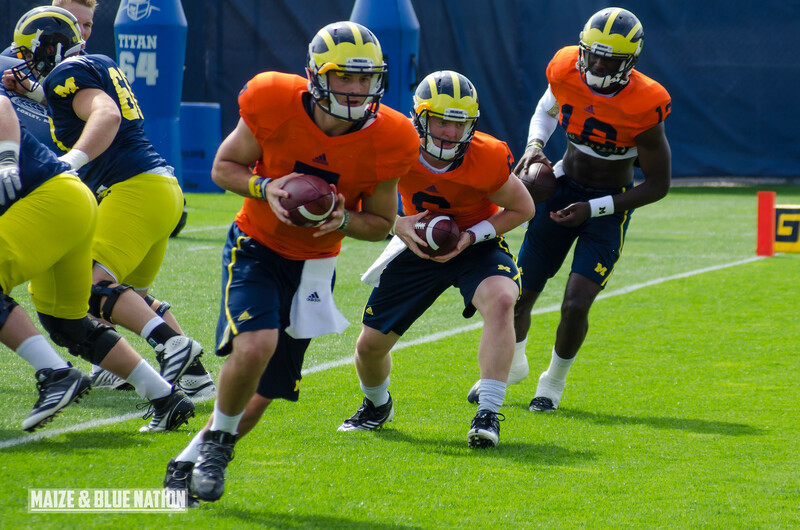 Walk-on Brian Cleary (#6) has been competing with Morris in fall camp for the backup spot. He looked decent in the spring game, but, you certainly don't want to see him in a game this fall. That would mean a lot of things have gone wrong. While the offense changes schemes, familiar faces remain from the old system while new faces step up. Nowhere will these be more evident than the offensive line. While Michigan features maybe the best set of tackles in the Big Ten in seniors Taylor Lewan (#77) and Michael Schofield (#75), new names and faces will emerge in the interior positions. Based on what we saw in April at the spring game, Jack Miller was likely going to be the starting center on August 31st. But so far this summer, he's been splitting snaps with Graham Glasgow (#61). I think the nod will still go to Miller to start against Central Michigan, but I wouldn't be surprised to see both. 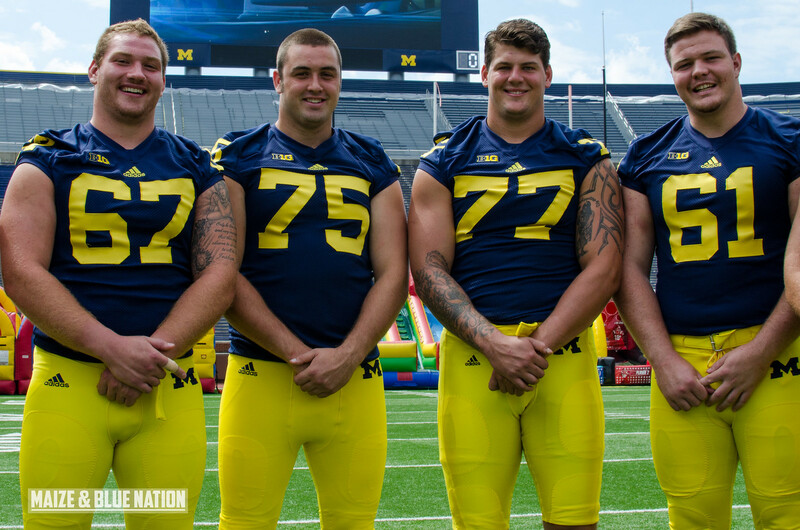 Redshirt freshmen Kyle Kalis (#67) is likely going to start at left guard and Ben Braden at right. That said, I wouldn't be surprised to see some rotation among the interior positions. Chris Bryant is another guys who I could see getting some playing time. Having Lewan back was absolutely huge for this group not only just in terms of his overall leadership, but it kept two starting spots intact from 2012, instead of likely having none should he had left (Schofield would've had to switch to LT). All signs point to a completely healthy and fully-healed Fitzgerald Toussaint (#28) returning to the backfield for fall. The senior ball carrier is Michigan's top rusher with 1642 career rushing yards and 15 touchdowns. While Fitz may be the starter in 17 days, he won't be the only one out there in the backfield. Michigan has a lot of depth at running back on Team 134 with guys like Thomas Rawls (who trucked Ross Douglas in the Michigan Drill video), Drake Johnson and Justice Hayes. But maybe the biggest splash coming into 2013 will be made by #27 Derrick Green, the true freshman out of Richmond, VA. The highly touted #1 running back in the country made the 2013 class immediately one of the top classes in the country when he announced in January. He was a little dinged up last week, but is expected to be fine. Also, don't count out De'Veon Smith. He's got plenty of size, although not quite like Green, but is certainly getting quite a bit of attention so far in camp. 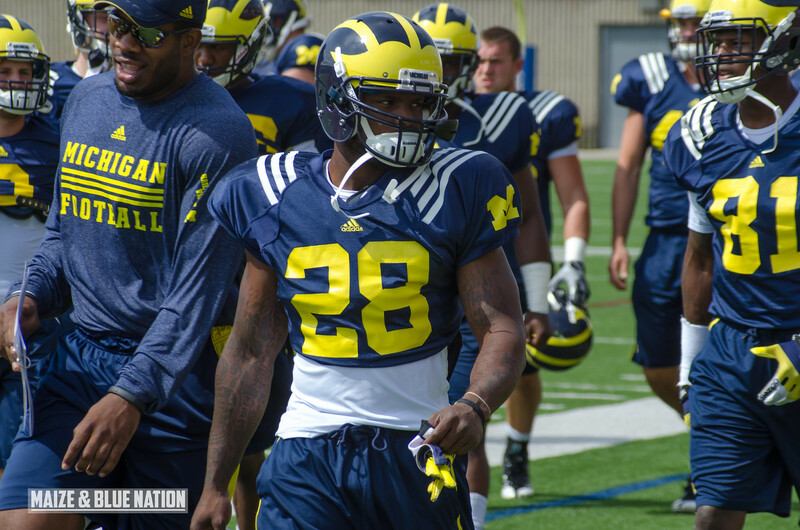 An area of concern for Michigan is depth and experience at the receiver spot. Now, of course Michigan does have good experience with slot receivers with guys like Drew Dileo and Jeremy Gallon (#10)...they will be integral to Michigan's success this year. But what we've been lacking are big, tall wideouts that Michigan had become famous for for so many years. Jehu Chesson and Amara Darboh are expected to be key targets for Gardner, but they are unproven at this point. Joe Reynolds and Jeremy Jackson could also contribute. I think among those 4, Darboh is the one to really keep an eye on. 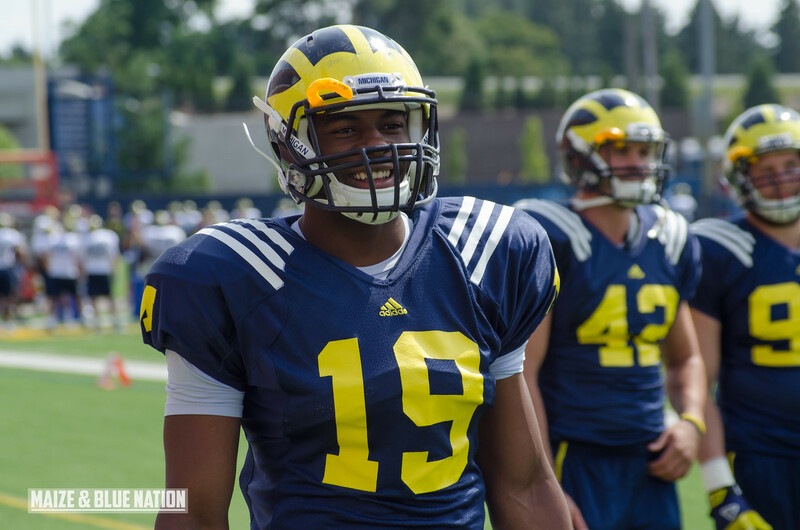 Michigan fans have quickly fell in love with tight end Devin Funchess (#19). Last year he tallied 15 catches for 234 yards and 5 touchdowns earning him a spot on the ESPN.com, BTN.com, Phil Steele and Football Writers Association of America freshman All-American teams. It was apparent when Gardner took over that Funchess was one of his favorite targets. In 2013, I think Funchess is going to be an integral part of this offense. It's clear he's put on some bulk since last year, which will serve him well going up against big defensive ends. If Michigan wants to be a dominant rushing team, a strong tight end is key. Depth is also key, so expect to see Jordan Pasorkz and AJ Williams in there, too. I've heard all 3 are looking good, especially with blocking, so far this fall. Next up, the defense. Stay tuned.